Are you wondering what to wear to the Texas vs Oklahoma game this weekend? Dallas is gearing up for the big Red River Rivalry game this Saturday. This game is so much fun, mainly because it takes place at the Texas State Fair. Big Tex is back. He had a minor accident last year. 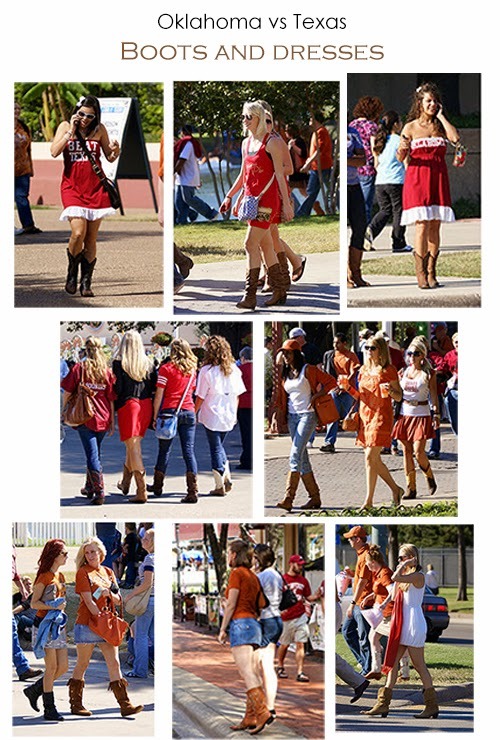 The Red River game is the perfect opportunity to wear your boots. It will literally be a sea of boots and dresses, especially cowboy boots. You will want to "bring it" to this event in terms of gameday fashion. All the Texas girls size up the Oklahoma girls and vice versa. There is a new bag policy, similar to the NFL. Check out this link. Make sure to indulge in some of the award winning fried food concoctions. Fried sweet tea, fried maple bacon, and fried chicken in a waffle cone, to name a few. Check out this guide to the fried goodies from a local chef. I wait all year for a Fletcher's corny dog. They are the best. As of now there is a chance of rain, which means definite humidity. I suggest using your favorite anti-shine and anti-frizz products. I would definitely suggest bringing some type of rain gear as well. I stick a few fold up ponchos like these in my bag. One last tip, make sure you take plenty of cash and your credit cards. There are ATM's at the fair, but the lines are always long. You need coupons to purchase any food or beer. It's on my bucket list to attend this game and go to the state fair!! Someday!